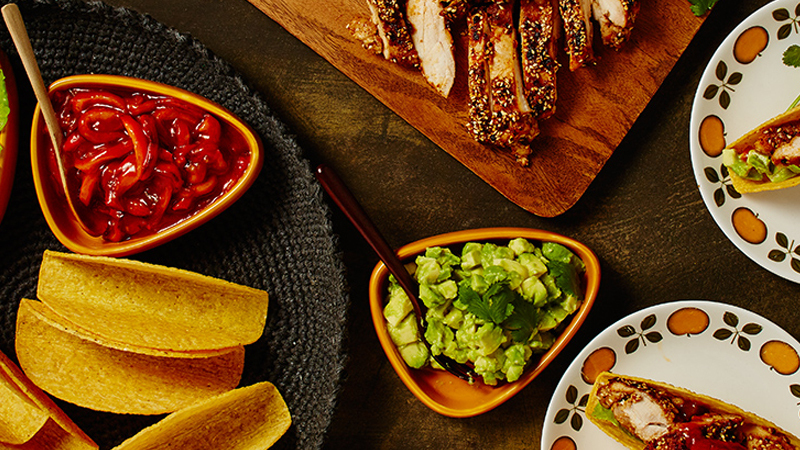 It’s awesome Mexican cooking, made easy. This recipe makes 8 simple and oh-so delicious chicken crunchy tacos – enjoy! Mix taco seasoning and sesame seeds together in a medium bowl. Spray chicken with olive oil and press into taco sesame mix to coat well. Heat olive oil in a frying pan and fry chicken for 4 minutes each side or until golden. Place on a paper lined tray to cook through in the oven, approximately 10 minutes. Allow to rest. Slice chicken into bite sized strips just before serving. Stir red capsicum strips through Mild Taco Sauce. For deliciously crunchy taco shells, follow pack instructions.